Published on February 26, 2010 in Complaints, General T&T and Politics. 7 Comments Tags: Hazel Manning, Local Government, Miseducation, Politics, T&T Govt. TWO WELL-KNOWN Arimians — parang icon Holly Betaudier, 85, and retired teacher and nutritionist Louis Horne — have taken Local Government Minister Hazel Manning to task for describing the borough as being “just bush” 56 years ago. “It is a pity that the person (Mrs Manning) had to say something like that. If Arima was only bush, 56 years ago, I would never have gone to Edinburgh University in London. Arima was not bush then. Arima made me who I am today. That person really does not know what she is talking about,” Horne stated. Published on February 26, 2010 in General T&T, Parliament, Politics and UNC. 4 Comments Tags: Basdeo Panday, Jack Warner, Kamla Persad-Bissessar, UNC. She gave an address to supporters and reporters moments after being given her instrument of appointment at President’s House, St Ann’s by President George Maxwell Richards who called it “a most historic occasion”. 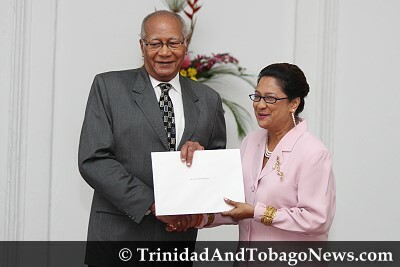 Kamla Persad-Bissessar yesterday replaced her ‘political guru’, Basdeo Panday, as Opposition Leader-a position she now adds to an impressive resume.